These blink sales happened at a time when people are sleeping in Europe. So, sadly, missed most of them. Don't worry. Next time the prices change at MST midnight and there'a glitch in our favor we would it consider it an unofficial blink sale. Here's a thought that keeps me from loading up on cheap stacking items, and this is just me personally. This is just a practice that is working for me, and not intended to be a right way of doing things post. It's just what I noticed after taking a hard look at what I was buying. When I looked at and added up a few days of those cheapie stacking things, and then looked at what I spent for a few days (in December during the sale), it was nickeling and diming me too much. Now, instead, I buy the exquisite new products. For example, I see many people ooohing and ahhhing over that antebellum mansion and then saying they can't afford it- and it's not "cheap" compared to the $2 stuff- but not buying six or seven cheapie items at a time (or more) paid off for me, I limit it to one or two in about a week's time- and got the mansion. I was only able to buy the the mansion because I made a conscious decision not to scoop up so many of those cheapies / old stuff. I'm still wiped out from that December sale. Note I said I don't buy many cheapie stackings- if it's a Gen3F/M, I'll do it. Those things go on sale over and over again, and there's always more glitches. Always. Been that way for the four years I've been here (going on five.) Think $1.75 is a great deal? It's probably been 1.00 or less previously. Look at what was listed just one page back- that's $14 or more in just one order. Those have been on sale many, many times and will be again for March Madness in all likelihood. I got the mansion for $18.87, and the cheapies the past ten days probably added up to about $6 (guessing. I got the Tarot Cards and Kitchenware, for example. Usable props.) The other thing is by not buying the steeply discounted day after day, I can scoop up the newer items in Fast Grab, that sometimes stack, and get THOSE for 80% off. At a minimum, they're 70%. The other thought I had, is the PAs make future product decisions based on what sells, and most of the sales come at release. So by buying and showing interest at the new items, it may help indicate more quickly what we want in the store. I usually don't buy them unless they're at least 40- 50% off, and those sales in December makes 30% very blah- but even 40% for a new item is nothing to sneeze at- since I've started modeling an item (personal use) I have a deeper appreciation for what goes into a product. That mansion for $19 is a STEAL, it's HUGE and has the interior too. Wow. So, as I said, just a thought. Have you added up what you're spending on oldies/cheapies IF you're wanting newer items? It's true that not everyone does, and many people are building their product libraries. Kit bashing is your friend. And there's the thrill of shopping, and getting a great deal- that's hard to pass up. I know, however, I've bought MANY cheapies over the past years that I've never used. It was a waste of money for me. So now I really ask myself- am I going to use it? Really- am I going to use it? Then, anytime soon? So just putting this out there. Novica, to a certain extent, I'm doing the same thing. I mean, I filled up my cart last night with those cheap hair items... and then added something I was interested in that was a new item, and my total was $20 at the cheapest. So I cleared the cart. I have a lot of hair. You can always USE more hair - but the truth is, I have a lot of hair I'll never use, too. So... do I need more hair? I've got about half a dozen hair sets that I generally go to first. So I cleared the cart. The required new items didn't have one I really wanted. If I'm *interested* in a required new item and it causes a great stacking discount, I'll throw in the cheap items too. If there is a required new item that is dirt cheap that will trigger the stacking discount, I'll thrown in other cheap items too. But I'm not going to buy an expensive new required item I don't need just to trigger stacking discounts. Well in the 10+ years i have been here the one thing I have learned is to say, "will I use it" and lately if it's an environment or prop, I look at how resource intensive it is and if I can add multiple figures to it and have it work. I have found that March Madness hasn't done much for me the last few times, guess we'll see. @Novica, trying to do similarly, as having created a catalog of most of my items, really was hit by how many things I own that I never use. And seeing too many carts of incredibly cheap items add up to too much. Plus trying to buy things that I hope will influence PAs to make more of the same (quality men and men's things, etc.). Also setting goals of spending some time transferring morphs between generations with GenX before buying similar characters. I look at some of the characters I own and they are clones of each other, I swear. Yes, you know it's true when you look at a new release gal and know 1. exactly who made it 2. you swear you have her almost-identical twin sisters. Thank you to the vendors who take the time to make unique characters who are so different from each other! Good points, Novica! I've started doing that too. I love a great bargain, always will, but I've been trying to hold out for the new releases that are really distinctive. I also want to support my favorite PAs with my "vote of confidence" by buying their products when they are released. The Antebellum Mansion and Elvis Suits were no brainers. They totally blew my budget, but I've wanted both for a long time. I found a way to make it work, pinched from other budgets and dumped my cart a few times of cheapie stuff for the same reason you did- I know they'll be on sale again, and it's okay to throw them back on the wishlist for now. Those wishlists are great, and Wishlistify is even better. I've bought so much over the past few months that I don't even know what I have. I need to start cataloguing and actually using it. But I'll admit, I do love to shop here. It's probably one of the funnest places online to shop, and I love seeing my purchases show up in the Product Library within seconds. Shiny objects on sale + instant gratification = deadly! I am in the same boat, you've got one oar and I have the other LOL. I'm not trying to be a hypocrite here, I have SO much stuff and that's why I wanted to emphasize this is my strategy I've tried off and on, was more "off" until after that December sale and I said, "What the heck am I doing? Have I even USED any of that?" Because I'm like you, I can't even tell anyone what I've bought due to all the $1-$3 stuff I loaded up on. The one that stands out is the Bast Hair, which I featured over in my art studio thread. Love that one. (Be sure and get the version you want, I believe there's v4 and a gen3f. The whole idea was that there were a lot of skin map textures out there for free for V4, but Gen 1, 2 and 3 aren't as easy to come by free - so if I could just use those V4/M4/A4/G4/S4/H4/F4 skins on later generations, I'd have so many more options. Now I need to start converting characters and poses. When I was a Poser only user I scooped up a lot of cheap V4 stuff when Genesis started and I still do now when on super sale, if it's something I don't already have and want, because I can still use it in Poser! But I already have soooo much V4 stuff but I love the variety and if I can get something good for like $2.00, I go for it. I do a lot of postwork and non-realistic art, so not everything has to be IRay. I can't wait to try some of the many 79 cents sets I got in the PC sale because it forces me to try new things, get out of my box. I'm not even sure why I need photorealism for the stuff I do, to be honest, I still have to figure that out. But I have the opposite shopping strategy, sorry PAs but I'm a struggling artist myself, and scoop up those deals as I can! I've found so many times that if I add a new item to my cart that I would never normally buy, the rest of my cart goes down so drastically that the new item is not only free but saves me money! I ONLY buy new items if it triggers another sale, but the ones I want all get wish listed for later. When I first started with DS last March I overpaid for things because I didn't understand the shopping game LOL. Check out the RDNA Top Sellers in the Southern Charm Sale. They are stacking for bargain in cart prices. Wow! That's even less than I paid the other day. Awesome deal! I have most of those bundles and they are very good. If you bought one of the Southern Charm new releases for your order, make up a new cart, take a screen shot, and submit a request for a refund of the price difference. Dangit. I had 63 items in my cart at 53 and 54 cents with a Southern Charm new release and they all just jumped to $1.00 each. Thats still cheap but before was better. The Southern Charm offer is stacking with today's RDNA/PC+ offer. 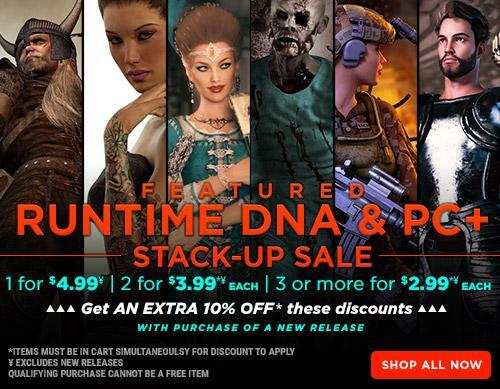 If you stay with RDNA items in the Southern Charm "Featured Runtime DNA Top Sellers" you get the "Stack-up" price (as low as $2.99 with 3 or more) and then 80% off of that. If the prices were an error you can't expect Daz to give you the difference between the error and the correct price. Then the new price ($1) is the new mistake ? It may not have been what they intended, but it is what was advertised. And they need to honor their advertising or one of these days it's going to come back and bite them... Big time... And then we all lose. Can't reasonably expect, maybe. But quite often I've seen (on the forums, at least) DAZ respond to cries of "it's not fair" by honouring the error or making a glitch available officially. Bitching and moaning seems to be taken as a negotiating position. The only mistake I've been able to work out is buying multiple RDNA products through the Southern Charm offer was getting an additional 10% off, which should only have been triggered by the purchase of TWO new releases, and should NOT have been applied to anything but the new releases. The 99¢ - $1.00 price is 80% off of the $4.99, and not applying the Stack-Up discount for multiple items in the cart. Those products should be 60¢ if you purchase 3 or more with a qualifying Southern Charm new release. If Daz doesn't want to give those products the Stack Up price, they need to remove them from the Stack Up sales pages. And honor the discounts in the meantime. ETA: for the record, I didn't realize the extra 10% was being applied when I made my purchase. I just put a new release in my cart and started adding products to see what the final price would be. When I saw it was 53/54¢ I added a few more. It looks like DAZ pulled all the Southern Charm RDNA Top Sellers from today's RDNA sale. My cart more than doubled and went from $40 to $108. Grrr!!! I'll just dump everything and DAZ will lose out on my purchasing anything, inc,luding the Antebellum Mansion, for awhile. That's what they should have done before the Stack Up sale went live. You wouldn't be disappointed now, if the Top Sellers had never been part of the Stack Up. As many times as something like this happens, you would think they'd hire someone whose sole job was to make sure these things didn't happen! This happens all too often We should be able to expect them to honor their sales offerings.It was not a random glitch but the normal result of the Southern Charm RDNA Top Sellers and today's RDNA and PC+ sale stacking. Then all of a sudden after we posted about it DAZ decided to pull the RDNA Top Sellers from today's RDNA sale. If they choose to not honor the original listing then I chose to not purchase and we both loose.